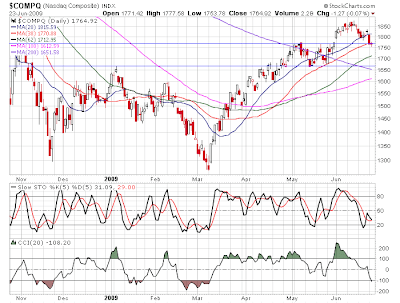 A review of the chart indicates there is some strong support around the current level. Now, below this level, we got air. We have no real support from this previous rally to suggest any potential support. If the SP500 breaks the 880 support, a new support will have to be created. Will 850 be the level to which buyers enter, creating a new support level? Maybe... but why 850? 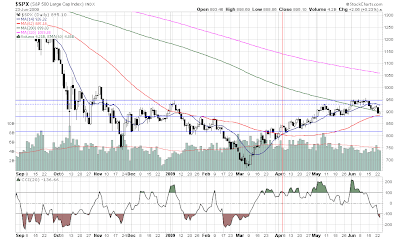 If we break the current support, while being oversold, IMO, fundamentals may gauge new buyers. When things get too cheap to ignore, with the new mindset of stability, massive buyers will come in. Unless the overall market will take its que from the Nasdaq, and wait for it to hit firmer support with a more oversold condition. At the moment it looks like it can test 1713 or so. Whatever the case maybe, valuations have gotten a lot better since (very literally) two weeks ago.